Villa Vista is a spacious and luxurious 3 bedroom detached villa occupying an elevated position, with views across open countryside. Villa Vista has been recently furnished with modern furniture and decoration, with attractive landscaped gardens. Villa Vista comfortably accommodates 6 people, in three large bedrooms. The Villa has a spacious living and dining room which overlooks the perfect view across the countryside. The villa has a large south facing patio with a good sized private swimming pool (approx 8x4m) and unobstructed views across open countryside. There is secured parking for 2 vehicles. 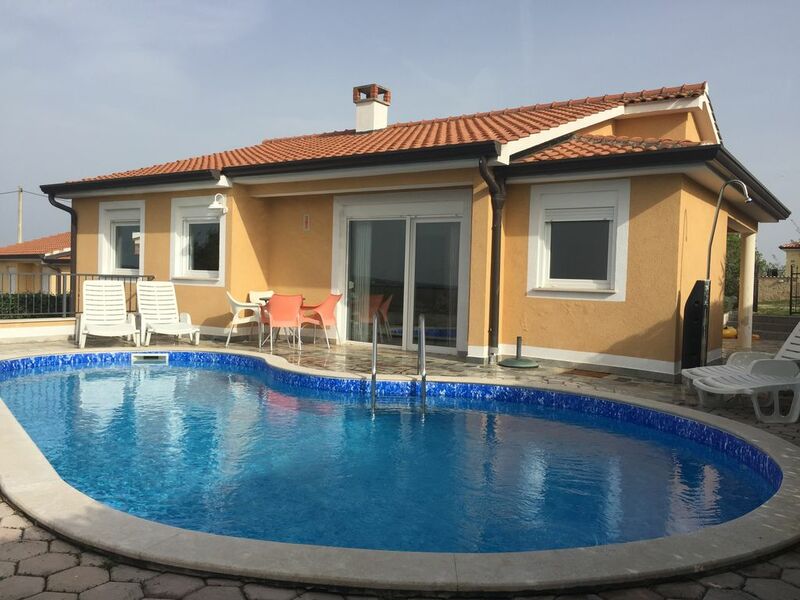 Villa Vista is located on the edge of the small village of Montizana, just 10 min drive from the coastal resort of Zelena Laguna, 15 min drive from Porec and within easy reach of Adriatic coastal towns and hilltop villages. Shops and several excellent restaurants are just a few minutes drive away. Outside: The villa has a patio featuring a private 8x4m swimming pool. Outdoor split level patio furniture and sun beds are provided and seperate BBQ / dining terrace. The property occupies a quiet and secluded position, amongst a handful of other villas, yet is only a short drive from the coast and other attractions. Coast Beach: Beautiful beaches are located in small coves along the coast within a 10 minute drive. Many are rocky with swimming platforms that extend out into the sea. Southward along the forested coastline are the resorts of Zelena Laguna and Plava Laguna, as well as Marinas at Vrsar and Funtana. (For further information or to check the personal website, please, do not hesitate to contact the owner of the property). We are married and live in Hertfordshire with our young family. We love Croatia. The unspoiled nature is a welcome retreat from other Mediterranean destinations. The scenery is amazing. The food delicious, and still great value. Renting a villa is a big responsibility. We really appreciate that your accommodation is a big part of the holiday experience, as is the communication during the booking process. Petra's father came to England from the former Yugoslavia in the 1960's. As a result Petra spent many long family summers in Croatia while growing up. We wanted to share this experience with our own family and friends, so bought a property. Because we holiday there ourselves, we've invested alot of time and effort in making the villa as family friendly as possible. We know the area very well and all our guest book recommendations are from first hand experience. It's near to Porec, yet far enough away to enjoy peace and tranquility away from the hustle and bustle. Usually a gin and tonic/beer while the sun sets! The view is very special and Montizana is near to many points of interest. Also a great way to visit Venice. A calm and special place to take a break. Bathroom one also houses a washing machine. Private heated pool. Temperature +25 - +27 guaranteed. Villa Vista welcomes families but regrets that no pets are allowed. Villa vista is a non smoking villa. The 3rd bedroom is a bright spacious basement room accessed by staircase from the open plan living area. (For further information or to check the personal website, please, do not hesitate to contact the owner of the property). Villa Vista is superb, the photographs don't do it justice. It has an open plan living/kitchen area, which is perfect for family time together. The bedrooms are spacious and beds comfortable and the air conditioning works a treat as when we were staying the temperature was over 30 degrees every day. The pool exceeded our expectations as it is much larger than the photos depict. From the house, patio and pool the views of the surrounding countryside are amazing. We utilized the BBQ which has its own secluded seating area at a lower level to the pool. The pool and gardens were maintained to a high standard and the house was very clean, towels and sheets were changed weekly. The villa is situated in a small hamlet and although there is a house either side, the perimeter of the garden is very well screened with established hedges, providing privacy. A ten minute drive takes you to the historical coastal town of Porec, with cobbled streets, and quaint buildings. You are spoiled for choice with places to eat and drink. We caught the ferry from Porec to Venice, which can be as a day trip or stay several nights in Venice as we did to explore. There are many things to do in close proximity to the villa, we visited historical villages, caves, a roman amphitheatre in Pula and went jet skiing in Porec. Croatia is beautiful and well worth a visit. We drove from the UK, approx 900 miles from Calais, the journey was very easy and the Austrian Alps were spectacular. We will definitely to Villa Vista as it provided everything we needed and was excellent value for money. A very nice house and pool with a beutiful view. We had a fantastic time! We were four adults and two children (8,10) and it was spacious and comfortable for us. Two bathrooms both with showers was perfect. The contact between the owner and also the caretakers before, during and after was very smooth and pleasant, such nice people! You need a car to move around, the location is a bit remote from stores, restaurants etc, but that is also part of the charm and it is a wonderful place to really relax. We had a fantastisch holiday in this very well equiped Villa. Rest, relaxation in the middle of nature and still close to the coast and entertainment . Thank you for the lovely review. It was our pleasure to have you at our Villa. You are welcome back any time. Ideal family bungalow with enough space for a larger family. Everything you need is in the house and the view was far reaching. We used all the recommended restaurants and sight seeing trips and were not disappointed. We would def. come again. This is our second stay, and we enjoyed this as much as the first. The Villa is excellently equipped, clean and homely. The Air conditioning is a super addition. Our highlight is, great family swimming and enjoying the Views. We will return again. We have just come back from two fabulous weeks at Villa Vista. The villa itself is fantastic, great views, spacious, well equipped, excellent decor and a lovely pool. In the area we really enjoyed our time at Zelena Laguna where you can do everything from tennis, boats, snorkelling, bikes etc... all at very good rates. Porec is on the door step and lovely mountain villages less than an hours drive. A great place for a holiday. Thanks to Rob & Petra for all the information on the villa and a very easy booking process. Thank you for the review. We're really pleased you had a great time. Near a beautiful coastline located in small coves within a 10 minute drive. Much is rocky with swimming platforms that extend out into the sea. Southward along the forested coastline are the resorts of Zelena Laguna and Plava Laguna, as well as Marinas at Vrsar and Funtana. In terms of eating and drinking there are a number of excellent restaurants with fantastic food and great atmosphere. We can advise you of some of our favourites. We also have the contact number trusted local taxi company you may use if you wish to leave the car for the night. Although the villa is in a quiet rural location, the nearby town of Porec has a great lively bar scene for those who wish to indulge. There is also the new large dance club 'Byblos' 4 kms from the Villa, for those who have not used up their energy in the day.